The Highland Council is to carry out emergency works to stabilise the riverside wall on River Street, Wick, following flood damage, which has forced the temporary closure of River Street between Mackay's Hotel and Burn Street. Contractor, A & W Sinclair Ltd, has been appointed to undertake emergency repairs to the wall. Work is expected to start tonight at low water at 7 pm. The Council's Transport Environmental and Community Works Service and A & W Sinclair Ltd are working in close liaison with SEPA to stablilise the wall. It is hoped to reopen River Street to traffic, governed by traffic lights, once the initial stabilisation work is completed. On Monday night, a 15m by 4.5m section of masonry river retaining wall suddenly bulged outwards. The section of wall is considered to be unstable and likely to collapse into the river. The adjacent River Street, which is a major route into the harbour, is also in danger of collapse. From inspection, it is considered that the upstream groyne created a back eddy which scoured out the original foundations causing the wall to move. Richard Guest, Head of Roads and Community Works, said: "The bulge in the harbour wall is significant and has required us to close off River Street for safety reasons with immediate effect. "We have awarded a contract for the stabilisation of the wall and work will commence at low tide tonight. We may reopen River Street to single-lane traffic following a safety assessment when the stabilisation is complete. 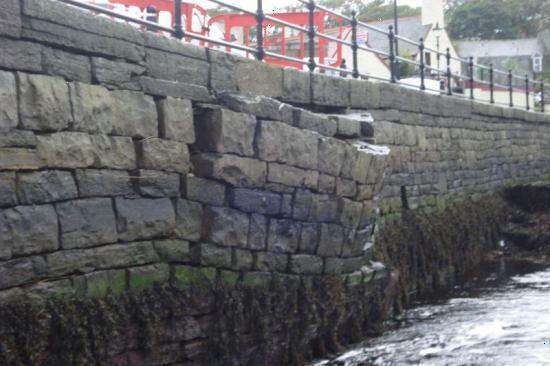 We will then need to design a scheme to repair the harbour wall and award a contract for this work."